Names that are not in accordance with the historical period will be assessed by the staff and a request for changing the name will be sent to the those whose name does not comply to the rules. Names that are clearly not in accordance or aren't appropriate will be changed by the staff without warning. Players will be able to choose a Kingdom where to play. 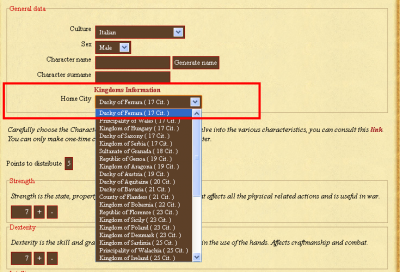 For each Kingdom, the number of residents are specified. It is possible to see a Kingdom Informational Page from the link Kingdom Information. When you start out in the world of Medieval Europe, you will have the opportunity to set some base skills: Strength, Dexterity, Charisma, Constitution and intelligence. These attribute points will contribute a lot to the game play and the way you play your character. For this reason, it's very important that you consider the way you allocate these points. 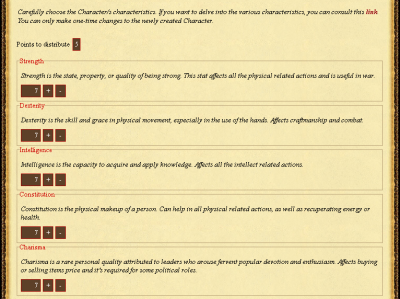 Below there is a description about each attribute and how it affects a character. A maximum of 40 points can be distributed. The maximum points assignable to an attribute in character creation phase is 15. It is possible to change points distribution after character creation from your profile page for one time only and before the character is 30 days old. Dexterity represents the grace and the skill related to physical activity. To control certain structures, you need to satisfy some Requirements. Charisma is one of them. Read carefully the Requirements table before you set your attributes. This page was last modified on 3 January 2016, at 12:22. This page has been accessed 72,853 times.